In the municipal center of Newport Beach, California, sits a local oddity that is equal parts controversial, cuddly, adorable, and absurd. 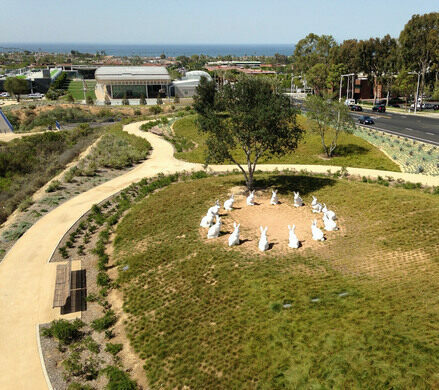 The sculpture, dubbed “Bunnyhenge,” consists of 14 large white bunnies arranged in a circle, with two even larger 8-foot-tall bunnies found nearby. While these oversized stone bunnies sit stoically staring at each other with their colorful beady eyes, the town around them has become divided over their existence. When it was first installed in 2013, the sculpture was initially very popular, especially with children (creepy as some others may find a circle of giant bunnies to be). 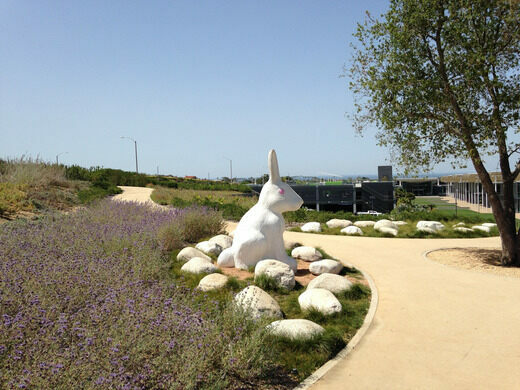 But the public artwork also cost the city $221,000, or nearly $14,000 per bunny, which outraged many residents. One candidate for city council—who was later elected—even declared that “we need to blow up the bunnies!” and made a campaign video of the bunnies’ heads exploding. Despite the threats, the bunnies have made it nearly five years, and can still be found strangely and stoically gathered in the park by City Hall. You can park at City Hall and walk to the bunnies up the hill near the bridge. There are many other cool sculptures to check in the well-maintained park. One of the only known surviving Coconut Palm trees in the entire state of California. A herd of colorfully painted bovine statues can be found in the middle of "cowtown."